What was Italian cuisine like before the tomato arrived from America? Pasta alla gricia gives us some idea. Widely considered the ancestor of the more famous bucatini all’amatriciana, it is a simple dish that, according to at least one legend, originated among shepherds in the mountains around the town of Amatrice, being made from pasta, cheese, cured pork, all things that the shepherds could carry around with them for days as they grazed their sheep. 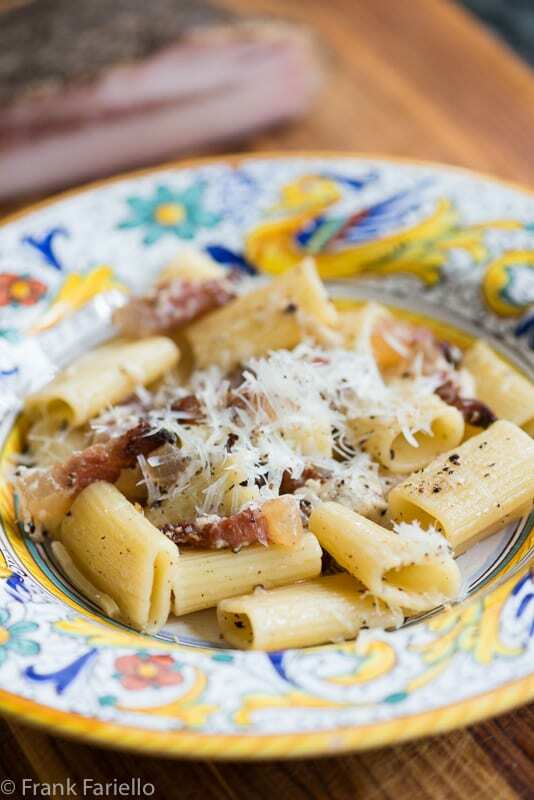 The thing that makes pasta alla gricia special is guanciale, or cured pork jowl. 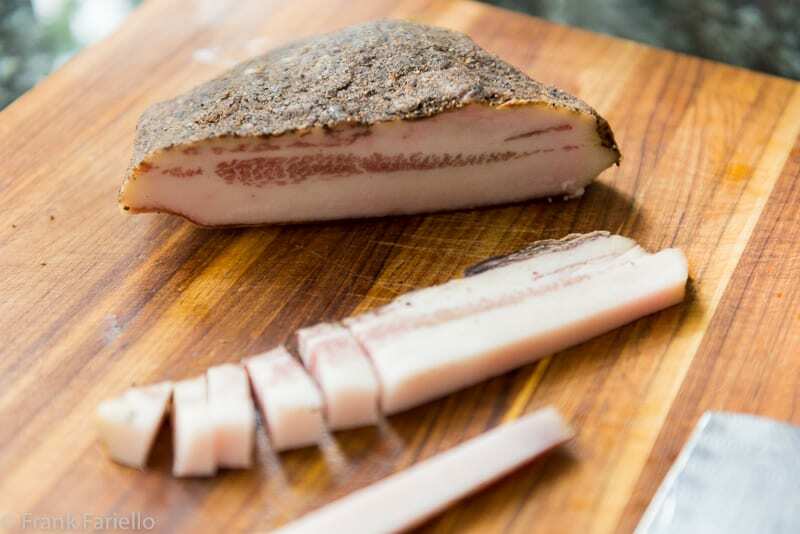 Rubbed with salt, pepper and spices before it is hung for at least three weeks, guanciale has a more assertive taste than its better known cousin pancetta. It is quite fatty, too, and its rendered fat lends lusty flavor and unctuousness to this rustic dish. Truth be told, guanciale—and not pancetta—is the preferred ingredient for amatriciana and carbonara, too, but in pasta alla gricia it really is the indispensable star of the show. Although less well known than other iconic pasta dishes from the region, you could consider pasta alla gricia as the mother of them all. Add some eggs to this dish, and you have a carbonara. Add tomatoes, and you have an amatriciana. Take away the guanciale, and you have a cacio e pepe… Yet another example of the Italian genius for drawing out almost endless variety from the few humble ingredients. Cut some good slices from the guanciale, trim off the tough bottom skin, and cut into strips. Sauté the strips in a skillet over gentle heat until the guanciale has rendered quite a bit (but not all) of its fat and has lightly browned. Meanwhile, bring a large pot of water to a boil. Add a good pinch of salt and then your pasta. Cook until al dente. Drain and add the pasta to the skillet, along with a ladleful of the pasta water. Sauté the pasta in the skillet for a minute or two, until the pasta water has reduced into a kind of creamy sauce. Serve immediately, with more grated cheese and freshly ground pepper on top. You can make pasta alla gricia with either a short pasta, typically rigatoni or mezze maniche, or a long pasta, typically spaghetti, bucatini or tonnarelli aka spaghetti alla chitarra. But it’s versatile and lends itself to all sorts of shapes. However untraditional, I bet it would go well with shells, for example. As mentioned, guanciale really is a must for making pasta alla gricia. You can find in better Italian markets. But if you can’t find it in your area, you can order it online. And if you fall back on pancetta, the dish will still be delicious—just don’t call it pasta alla gricia. Some people add a bit of peperoncino to their pasta alla gricia but, since capiscum is a New World import like the tomato, it is surely not original to the dish. (Some say even the black pepper isn’t original.) And, despite what you might read in some English-language recipes, an authentic pasta alla gricia does not include onion or garlic or, for that matter, herbs like sage. There are different stories about the name gricia. Perhaps the most common is that it is named after Grisciano, a tiny village in the area where the pasta originated. Others say that gricia is a bastardization of grigio, the Italian word for gray, since the custom of frying the guanciale in an iron skillet supposedly lent a gray cast to the dish. Yet another story has it that it comes from grici, the name Romans gave to the inhabitants of the area. Another says the dish comes from Grigioni, the name given in the Middle Ages to German and Swiss bakers who, when they immigrated to Rome, turned to curing pork. And so on. I guess we’ll never know for sure. Life can be so strange. The above post was written earlier this week, before the terrible earthquake that shook central Italy, tragically destroying the town of Amatrice. When I first heard the news, I thought I should perhaps delay posting out of respect. But then I thought, no, let me go ahead and publish this recipe as a tribute to Amatrice and its wonderful culinary legacy. And, indeed, I guess I’m not alone. It seems the internet is swelling with recipes for amatriciana. Its older sibling, pasta alla gricia deserves attention, too. For those wishing to help the victims, this blog post from Domenica Marchetti provides several links to relief agencies. Living next door to our Italian neighbors, and having been through the same tragedies, we deeply feel the pain for the earthquake victims. It’s horrible. Our prayers go to all those affected by the tragedy. As for the recipe, as always, it’s delicious; simple, quick and easy to make, it’s perfect for any weekday when the available time is limited. Love this! It’s what I love most of Italian cooking: a few simple ingredients combined to make a fantastic dish. I’ve even made it using roasted butternut “noodles” and it was surprisingly good. (That recipe will be posted sometime down the line.) As for the guanciale, it was a very happy day when my Italian market started keeping it in supply. Now, I’m never without. You’ve shared a great recipe here, Frank. Thanks. Yes, I have thought that it’s the “basis” whenever I am making the various pasta creations you mentioned! You really hit the nail on the head Frank! How many favourite pasta dishes can one have? Certainly, at #5 all of the ones in your post! Thanks for posting this, Frank, especially after the earthquake. It is heartening to see so many people coming forward in love and support. I love this dish and have only had it in Rome. Luckily, I just got a small shipment of guanciale in the mail! A beautiful and informative post. I think your timing is perfect. Great recipe Frank. Actually I make something similar but with Parmesan cheese. I have good pecorino romano from my recent trip to Rome, so I will give it a try. Thanks, Paola! Parmesan sounds good to me, too—a milder flavor, of course, but one that I’m sure if equally delicious. Oh, how fabulous! You’ve brought back my summer studying in Rome. Grazie mille. Glad I could bring back those memories, Tony! I don’t believe I’ve had this dish, although I can certainly see how it’s the “Mother” for several others. I can get guanciale fairly easily (although it usually requires a trip to an Italian market — oh, go ahead and twist my arm and make me go!) but almost never use it. I’m going to have to start. Great dish, and the timing is so appropriate. What an awful earthquake! This dish is a great way to remember those have left us. Thanks, John. If you haven’t tried this, you definitely should give it a go. Not exactly dietetic, of course, but it’s really tasty and satisfying. The timing is perfect Frank, if it helps to bring recognition and funds to the needy. I’ll be making bucatini all’amatriciana this weekend, as part of my way to remember those affected in that region, but truly I always order pasta alla gricia when given the choice. Grazie mille. And thank you for your comment, Linda! You have brought a much needed spotlight on a terrible tragedy which I am certain touches all of your readers. Highlighting this recipe this week, for whatever reason honors the town and people of Amatrice – bravo Frank. Carissimo Franco, Gia´conosciamo da vecchia data come sono i nostri politici italiani, si fanno subito presenti promettendo questo mondo e quello dell ´ aldila´, pero´ dopo poche settimane spariscono con le loro promesse e lasciano indietro pesetti , cittadine e poveri cristiani in balia delle onde, la storia si ripete per mancanza de memoria. Solo pochi anni orsono nella citta´dell´Aquila ci fu´un terremoto tremendo e dopo tentativi di ricostruzione si scopri´che piu´di uno si fece ricco alle spalle dei poveri terremotati. Speriamo che non si ripeti, per il bene di tante persone sofferenti. Una preghiera per i defunti. Grazie. Excellent information, Frank. I wish we lived in an area where guanciale was readily available. I love the simplicity of the dish and it is a springboard for other famous Italian dishes. We are praying for all of the earthquake victims. I know their strong spirit will help pull them through this. Italy has survived so many tragedies over its long history, it’ll will survive this one, too. But of course, that doesn’t make the loss any less tragic. I do love tomato-less recipes for pasta – let’s the pasta shine. (As I write this, I have 70 just picked tomatoes….) I will be doing this – and it is highly appropriate that this posted. It honors early Italy, it celebrates Italy and even with a broken heart – it seems like this honors the country. Thanks so much, Claudia! That would be the spirit in which the recipe is intended. Yes, the earthquake is absolutely heartbreaking. I couldn’t watch too much of the footage as I was just getting sick. I can imagine that being my family in their village. I’ve never even heard of this dish, but yes, it’s just like cacio e pepe with guanciale! I’ll have to try it when I get home (in SF for a while), but will have to use my homemade pancetta as I’ve never seen guanciale in LA.